Our President’s Award event celebrates the contributions of key area leaders who share a passion for helping individuals and families live healthier lives and feel more connected. We are proud to honor Mona Patel (Albany), Bruce Bell (Bethlehem), Spencer Raggio (Camp Chingachgook), John Barr (Duanesburg), Kathy Fialkowski (Glenville), Josh Wainman (Greenbush), Donald Gibson (Greene County), Evan Walden (Guilderland), Andy Gladwin (Schenectady), Walter McKay (Southern Saratoga), and Jim Prout (Troy). We will also be honoring Circle of Champs as our Program of the Year. 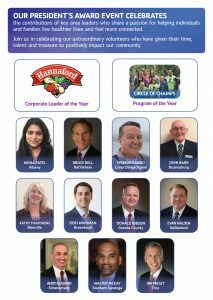 We will be honoring Hannaford as the winner of the Corporate Leader Award, as well as the signature partner of this event. Join us in celebrating our extraordinary volunteers who have given their time, talent, and treasure to positively impact our community. Partnership opportunities are available below. Please contact wjackson@cdymca.org with any questions.